Doesn’t your arm get tired after holding it in place during a Facetime conversation? I have been known to eventually forget that I’m on a video chat and the tablet eventually takes a nice picture of my ceiling while I am talking. 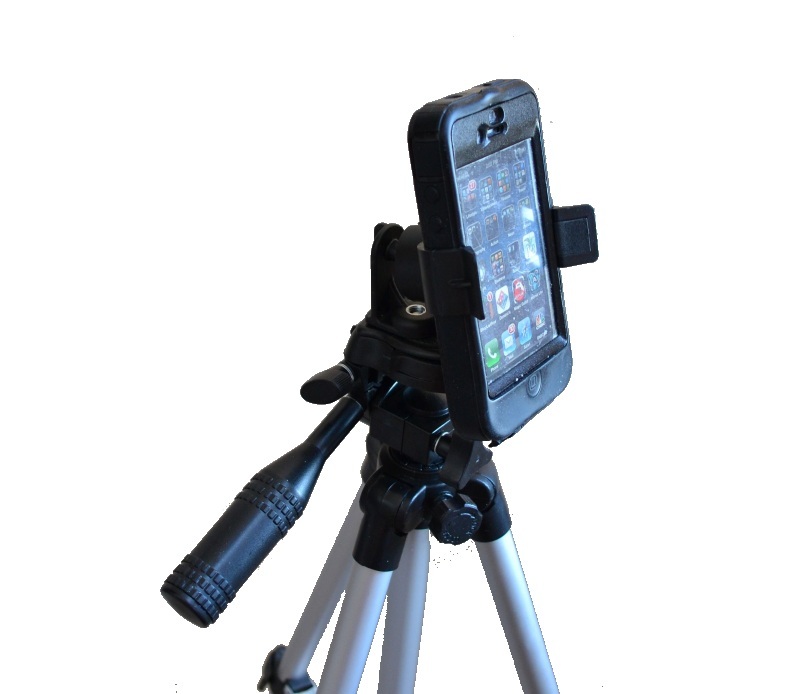 Coupling an inexpensive tripod with a mount for your phone or tablet is an excellent remedy to this problem. We find the same problems come up when watching a movie or TV show on your device. I mean how long can you possible hold a tablet? Lastly, many phones do not have image stabilization technology and this is what contributes to blurry pictures. A cheap tripod with a mount is the answer to all of this. Any tripod will do. Buy one that can be folded and has telescoping legs so that you can vary the height. Make sure the top of the tripod has the standard 1/4 inch – 20 threaded screw. This is the common size for almost all cameras. Although we aren’t going to use this for a camera, most of these mounts will deploy an adapter that will require this size screw. We have also seen these for attaching it to a leg of a tripod, but for the purposes mentioned within this article, we will just discuss those that attach to the top of the tripod. Most phone or tablet tripod mounts have two components. First is a part that will screw onto the tripod’s 1/4″ – 20 threaded post. The other end of this adapter will attach to a cradle. Select a mount that has an expandable cradle. This way, you can upgrade your phone, add a skin, use it in any orientation without have to purchase a new mount. These cradles typically come in two sizes. The smaller cradles will fit most phones and small tablets. The larger mounts will fit the big tablets like an Apple iPad. Most tablet tripod mounts are typically constructed of plastic. Be sure to select a mount that has tilt and swivel built in. Also ensure the universal cradle is heavily spring-loaded. You will likely use your device in landscape mode so you do not want it to fall out when the cradle grips are placed in the sides versus the top and bottom. Also, and this is important for video conferencing, be sure the cradle does not block the camera on the front or back of the device. I use a tripod in the living room. My wife has nightly FaceTime conversations with her sister. They are on video chat for over an hour. Every night. This greatly affects my quality of television watching where I am often banished to a distant part of the house so that the baseball game does not interfere with their discussion of the day’s events. While one may question if video adds to the value of a discussion over the weather or the spiciness of the pepperoni on the Domino’s Pizza we consumed the prior evening, apparently it does. So I am off to the den for another evening of the Jets losing yet another football game.